Click here to visit our LinkskyVisual.com home page. A form is a great way to allow your visitors to contact you, or to collect information from visitors to your site. LinkskyVISUAL has our own Form Widget. 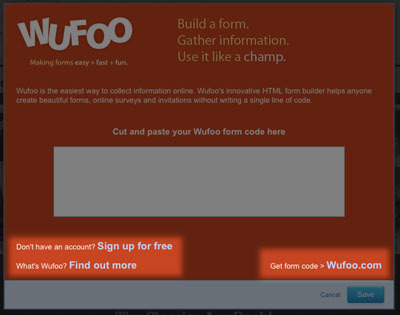 However, we also offer you another form option through Wufoo. This also gives you a fully functional, customized form that you can add to your site. Wufoo offers both free and paid services. 1. Go to Widgets > More > Forms. 2. 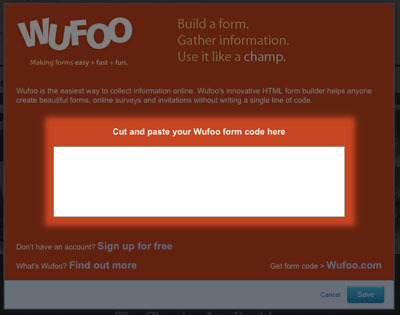 Drag and drop the Wufoo Form Widget onto your page. 3. A dialog box will open up on the screen. Click on the link in the bottom right hand corner and you will be taken to Wufoo's website. 4. Sign up for an account and create your form. If you need help, you can check out Wufoo's Support Page. There is a free version, as well as several paid plans. And there is a Demo, too. 5. When you are done creating your form, click on "Code". 6. You will be given various options of integrating your form. Select one of the first three options given to place onto your site. 7. Go back to your site in the Sitebuilder. 8. Copy the HTML code (use Ctrl-c or highlight with cursor > right-click > copy) and paste it into the Wufoo dialog box that opened when you dropped the widget (use Ctrl-V or right-click > paste to paste the code). The form will be added to your page. You can manage your responses in your Wufoo account or edit the settings so that you receive an email whenever someone has completed the form. Hint: Be sure to include links on your site at relevant points that will take your visitors to your contact form page (we have a link editor that allows you to do this). You can then either reply to them personally or post their comments directly onto your site.